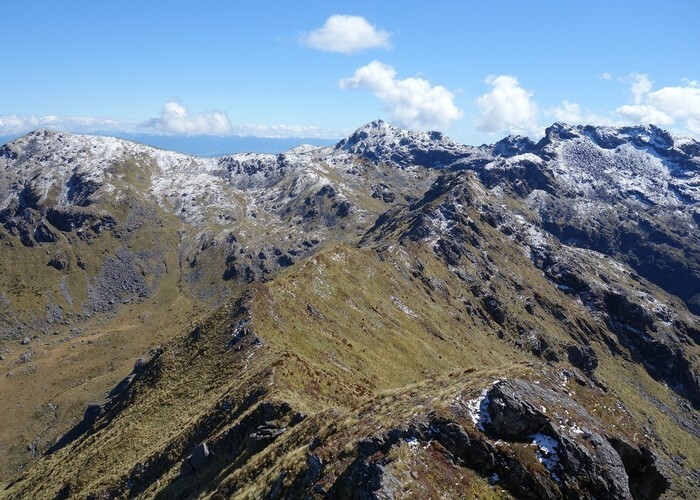 This photo looks north along the Elliot tops from Point 1388m just north of Mt Elliot. It is Troulands Creek basin, a tributary of the Ahaura River, on the left and a headwater basin of a branch of the Clarke River on the right. The mountain right of center that appears flattish topped is Point 1462m. I took this on Sunday 30th October during a ridge traverse walk to the summit of Mt Elliot. It was a lovely crisp spring morning just after a southerly had passed through. Not another soul was sighted during the trip but there were a few chamois about keeping watchful eyes on my progress. The marker on the accompanying map shows Point 1388m near Mt Elliot where the photo was taken from. Added 1 November 2016 by glennjglennj. 1 revision 1 November 2016 by glennjglennj.